I awoke with a mission! Oh, the small vanities of travel. My trusted old hot roller set had finally burned itself out in Delhi, and I needed to attend to the kind of dignity only hair care brings (smile)...so right after breakfast we bravely set out to find...a department store! Not so exotic after all, we found one within the block and I bought a very workable replacement. I blush even now to tell you the happiness a curling iron can bring in hot and humid weather! 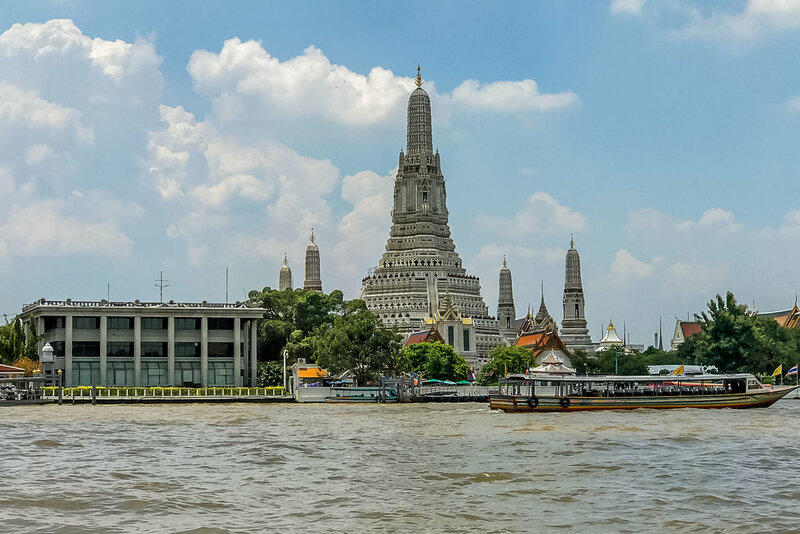 Then we jumped into one of the many boats available on the water to find the Grand Palace and Temple near it. We found an express boat and had quite a thrilling ride as it had time to get to full speed, but reached the dock with ease. A tuk tuk driver urged us off our course a bit, and though we missed our goal sites, we were able instead to see Wat Suthat, a Buddhist temple built in the 18th century. 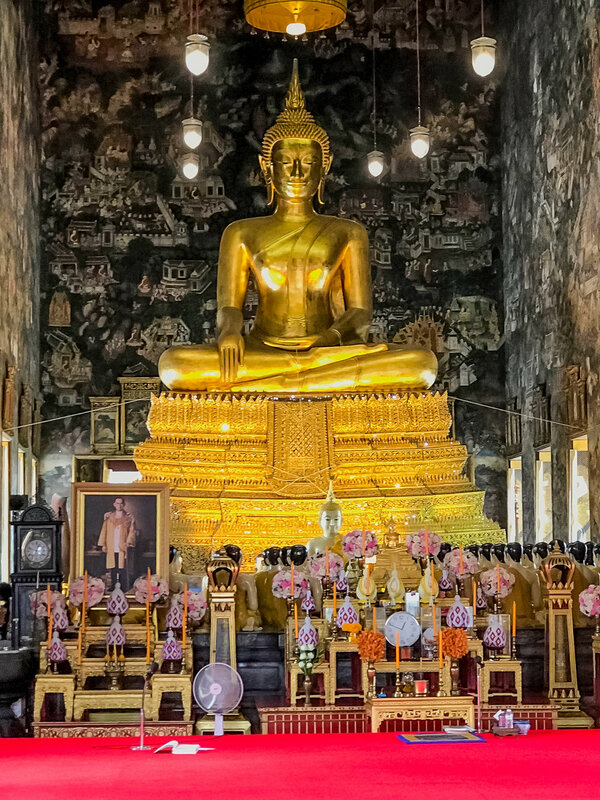 It houses a huge and beautiful Golden Buddha. 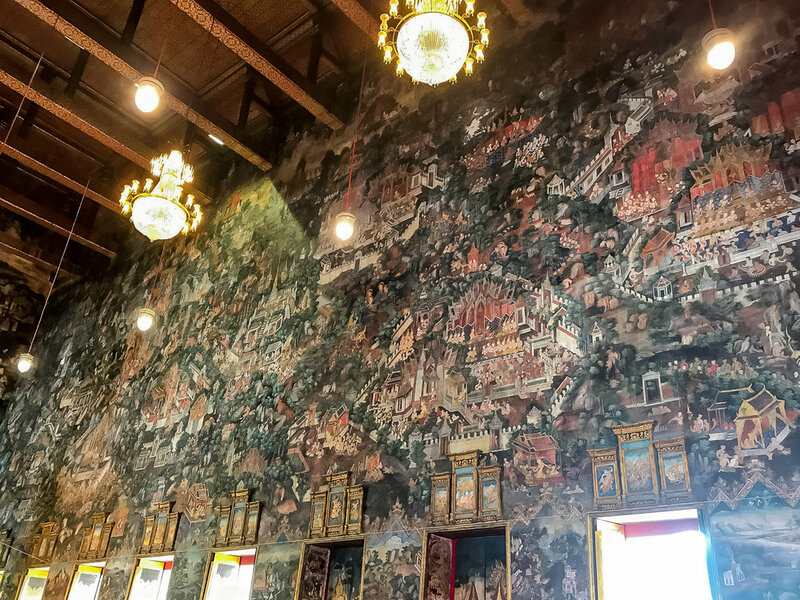 When we were there, art students were circled on the floor, capturing the Buddha, the painted illustrations on the walls, and the community of devotee sculptures sitting at the base of the Buddha. Later we went to the Wat Saket, the Temple of the Gold Mount where we climbed the 300 steps in a spiral to the golden-topped cone. 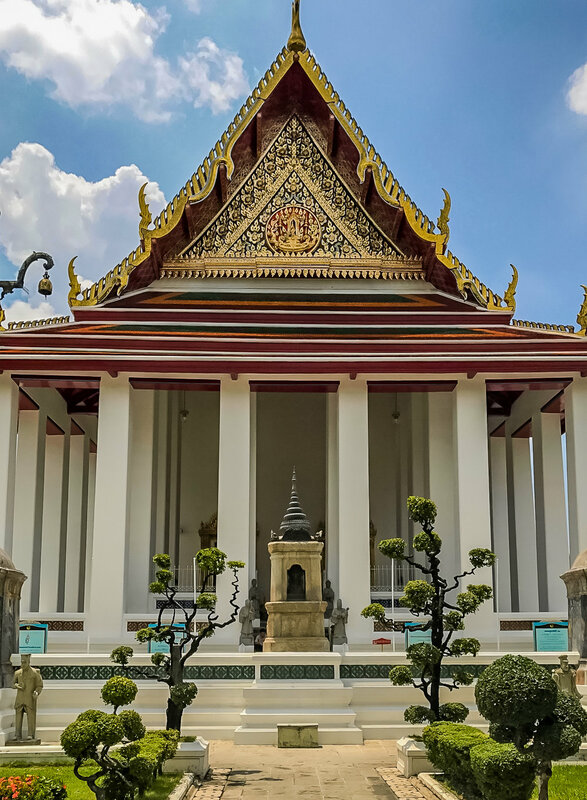 We passed the relic of Buddha, struck the gong on the roof, and surveyed Bangkok from above. Our time was just too brief, and when weather convinced us to head back to the hotel (via UBER!) we were disappointed to not lay eyes on the Grand Palace. Instead, we burrowed into the lobby area and enjoyed a lovely afternoon tea as the torrents came down outside. We freshened up for a dinner with the new friends who welcomed us to the city. Xuwicha picked us up by boat (because the traffic was wild at the dinner hour) and on the way to the restaurant we were able to see the Grand Palace from the Chao Phraya River, illumined in the night, in its glory! I so regret we don’t have a photo to share with you -- it is stunning! Dinner that night was the best of all! 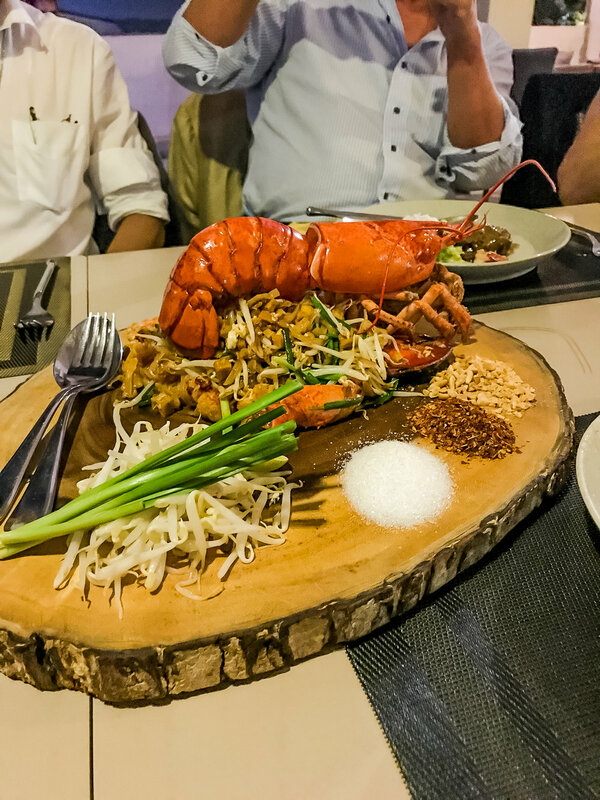 Lobster Pad Thai and Lamb Shank curry! It was a delicious, fun, delightful evening and we thank everyone there for the unsurpassed hospitality! (and the gift!). Boating back along the river in the evening breeze was a lovely way to end our visit, knowing that we’d see many of these friends at HondaJet functions in countries to come.